The city of Del Mar in San Diego County, California is an affluent beach community and the home of the Del Mar Horse Races. Del Mar in Spanish means "of the sea" or by the sea and the city enjoys a sub-tropical/Mediterranean climate with warm dry weather in the summer and mild winters. The city is governed by a city council of five members with one councilman or woman being chosen as mayor each year. 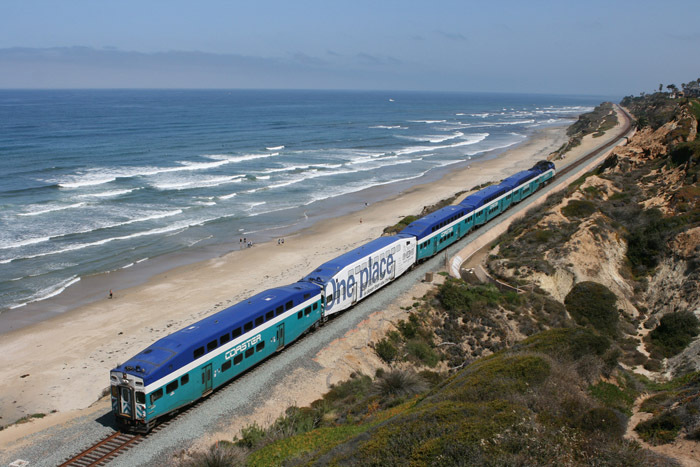 Del Mar is well known for it's beautiful beaches and sweet surf spots. The city has been home to many notable people like the jockey Willie Shoemaker, professional quarterback Aaron Rodgers, lead singer Steve Perry of Journey, Olympic figure skater Rachel Flatt and actors Desi Arnaz and Jimmy Durante. The area was first populated by settlers in 1882 when Theodore Loop, a Southern California rail men, built a tent city on the beach. His wife, Ella, named the beach after the Bayard Taylor poem "The Fight on Paseo Del Mar." In 1885 Colonel Jacob Taylor purchased 338 acres from Enoch Talbert in hopes of building a seaside resort. The Navy had an Auxiliary Air Facility in the community during World War II. The city is one of the few places that the rare Torrey Pine grows, the Torrey pine is the rarest pine in the states. According to the 2010 United States Census, Del Mar was home to 4,161 residents spread throughout 2,064 households giving the city a population density of 2,341.9 people. According to estimates from the San Diego Association of Governments in 2005, the median household income in the city was $169,348. Del Mar has so much to offer residents from the historic Tudor style square that is the center of Del Mar to the Del Mar's Farmer's market. Del Mar has so much to offer residents from the historic Tudor style square that is the center of Del Mar to the Del Mar's Farmer's market. The city is home to the San Diego County Fair, Torry Pines State Park, Los Penaquitos Lagoon on its southern border and even a dog friendly beach. Events such as the horse races at the Del Mar track and the Del Mar Antique Show, which is held three times a year, brings visitors from across the country and even the globe. Housing in Del Mar runs the gamut from small starter homes up through luxury beach homes with the majority of homes falling into the upper middle class or better category. Rental options include houses, apartments and other multi-family structures inland and on the beach. Other real estate options include condominiums, beach houses and town houses for sale or lease. Local real estate agents are waiting to help you in your quest for the perfect home for you and yours in beautiful, sunny Del Mar, California.